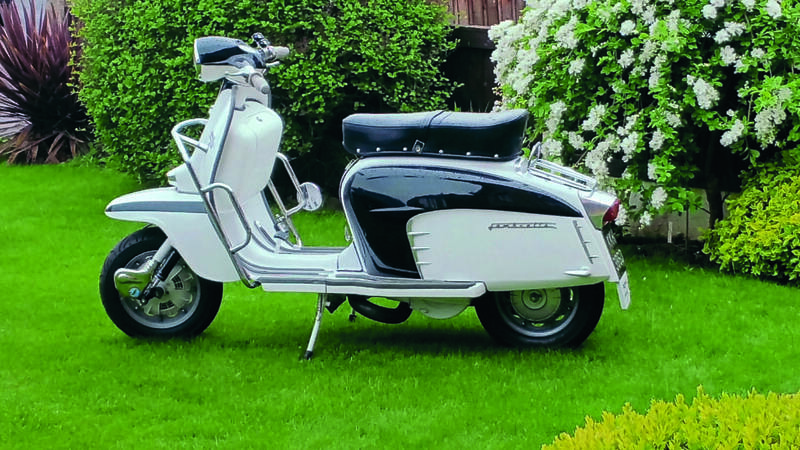 This month we embark upon the start of a series of dyno testing articles, covering the clubman style exhaust systems that are available for the Lambretta models. 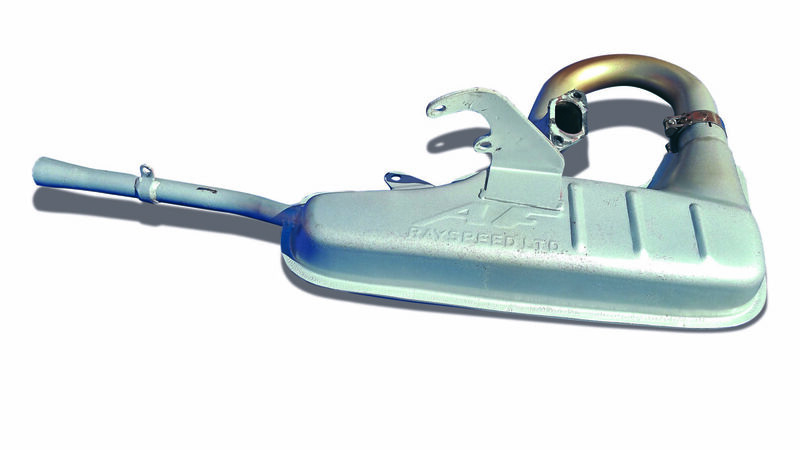 Using the original ‘oval’ two-bolt exhaust flange mounting which is found on all standard factory models 125-200cc, as well as many of the aftermarket cylinder kits on the market like the popular Rapido, Mugello, GT, Casa, Gori, BGM, Avanti etc. 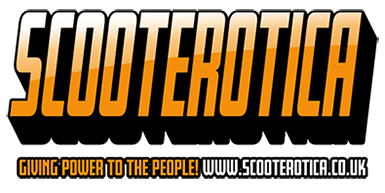 The current noted trend among many scooterists is to try and achieve an engine which provides an acceptable level of performance that is achievable, reliable, affordable and accessible. Sure a highly ported/tuned SIL225 cylinder may give good performance and reliability, but with tuning shops having long waiting lists for jobs like this and with the additional cost of parts/labour… many dealers will tell you that ‘pound for pound’ a porting job, plus piston kit/reed conversion etc. will set you back as much as an off the shelf kit! These kits come with similar performance, are available the same day (and every day should you need a quick replacement) hence the popularity of the many kits available. So what to choose? 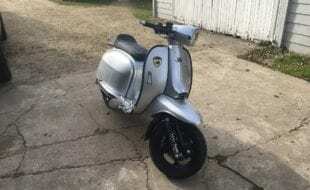 Well, local scooterist Rob Shaw had his latest build to offer, that was just run in and available for the job in hand, so he fetched it along and mucked in with the testing. It’s a cast GT186 kit that’s built onto a 60mm stroke crank making it 193cc, it’s received a small porting tweak and cylinder head rework that brings its performance up to a healthy figure more akin to that of a 225 motor. 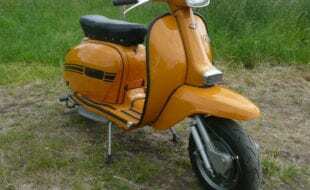 It runs through a 28mm Dellorto PHBH carburettor and already has a Gori racing clubman fitted. 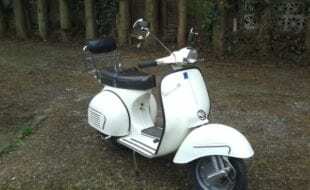 This engine will be great, as its power range and application is very common: a ‘high-teens’ bhp cylinder, using a clubman pipe, Delly carb and built for touring at a pace higher than a standard engine, but without going OTT on race parts. That description covers a lot of engines out there! So this is perfect to cover the smaller bore engines and cc, which means a future batch of tests on a bigger motor, perhaps a Rapido 250 or similar, should make for a very interesting comparison! Due to being a long term test it’s important to maintain some good testing regime data to have some results worthy of comparison, so various methods have been logged (some very important, some not so) but all useful in improving accuracy. 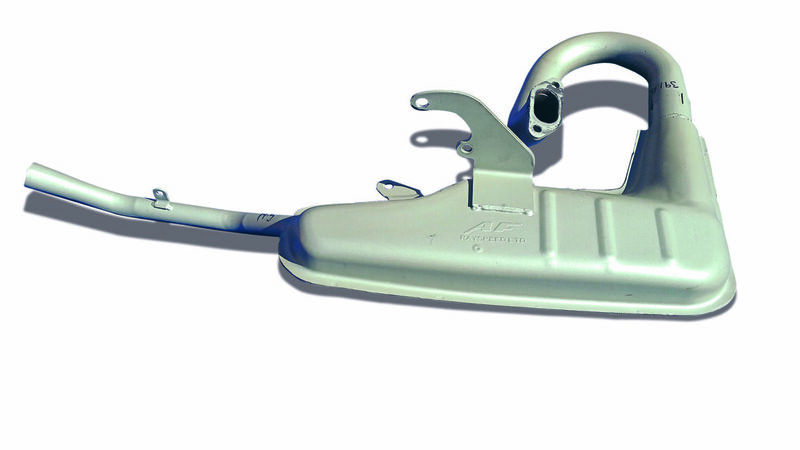 Tyre pressure and temperature along with wear band width are noted for starters, a slightly backed off brake to ensure no binding, a set wheel clamp position, rider position and no straps that would offer variable tension each time the scooter is loaded on. Also, we noted under the sparkplug head temperatures, which started at 150F on first run then a further two runs completed to whatever temp the motor reached upon completion. 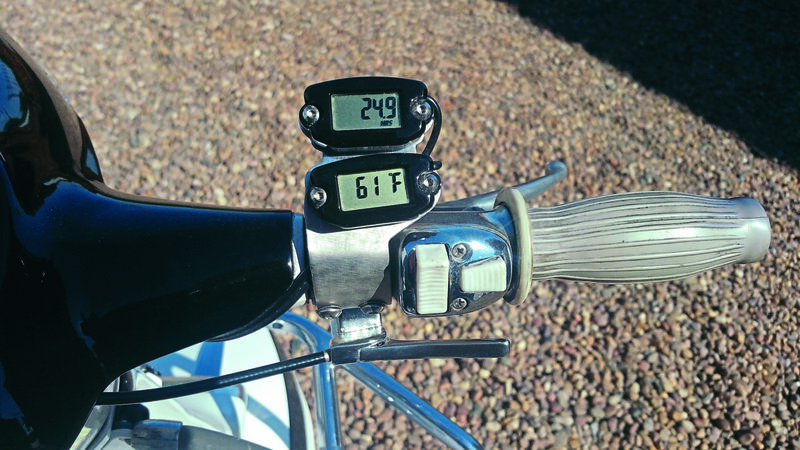 Rpm counter, CHT gauge, thumb choke. We were keen to see if any indicators appeared to suggest hot running among different pipes, especially when comparing their power outputs… we will come back to this data later in the series. 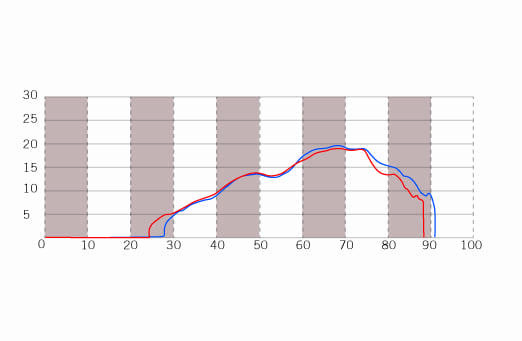 Another major variable in the dyno room is the weather correction factor (CF) which can either be automatically or manually input into the computer. It can marginally change power readings displayed as it’s presumed the weather data will do the same to an engine’s real performance on the road. So during the tests a keen eye was kept on the readings to make sure the range didn’t wander too far and a little manual climate control introduced via fans/extractors, open doors etc. 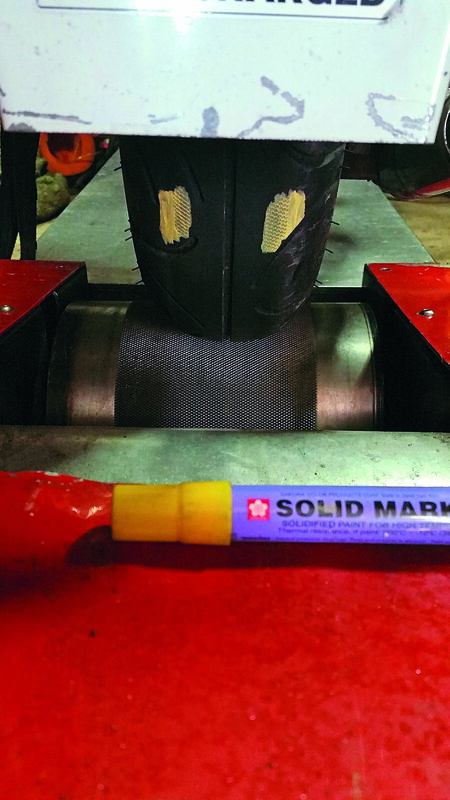 when needed, in order to maintain as constant a temp-balance as possible, across all testing. 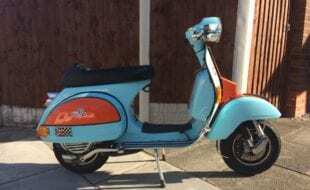 All runs were done in SAE J139 standard, so are comparable to the previous tests as the Lambretta ‘Bang for Buck’ article, as well as Dan the editor’s Vespa Mega Tuning articles, using the same make/model of dyno and settings. Interestingly, both Dan’s and my own dyno have in the past provided bhp results which compared very accurately to the facility that was run by Al at Diablo Moto, so old magazine test results should be comparable to these tests to quite a close degree. Now we have our dyno-donkey machine selected that will have each pipe fitted to it for ths first batch of tests, what should we compare it against? 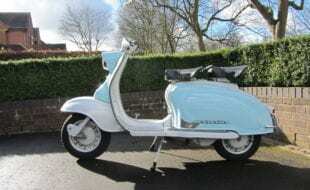 I find a useful baseline is always that of a standard Lambretta. There were so many of them produced, all putting out comparable and repeatable power outputs which the average rider can relate to. So we decided to use the SX200 as a base graph (same as for the Bang for Buck dyno graphs) coming in at 8.9bhp. Additionally, those considering a clubman would also probably be interested to know how it compares to a full expansion exhaust on the same motor so a well-known touring expansion was fitted, a JL Road KRP3 (JL3) to give us an upper benchmark. The clubman tests are displayed in red, with the standard SX200 in blue, and the JL3 in green. The test of the expansion pipe which would provide our ‘upper benchmark bhp’ produced an impressive result of 24.52bhp at a peak of 6900rpm, but had lost half of that by the time it had climbed on up to 8200rpm, so although it revved on past 9000rpm it was just over-rev and not usable power. Torque was good with 18.7lb-ft at 6800rpm. 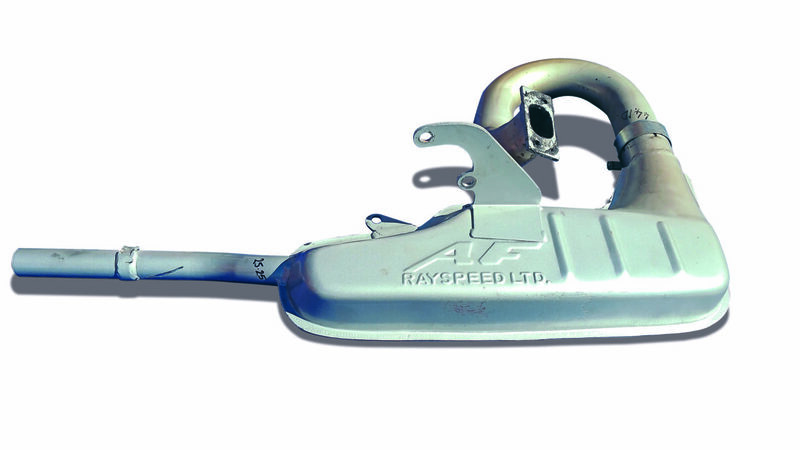 The first clubman test was the standard AF Rayspeed offering at about £80. 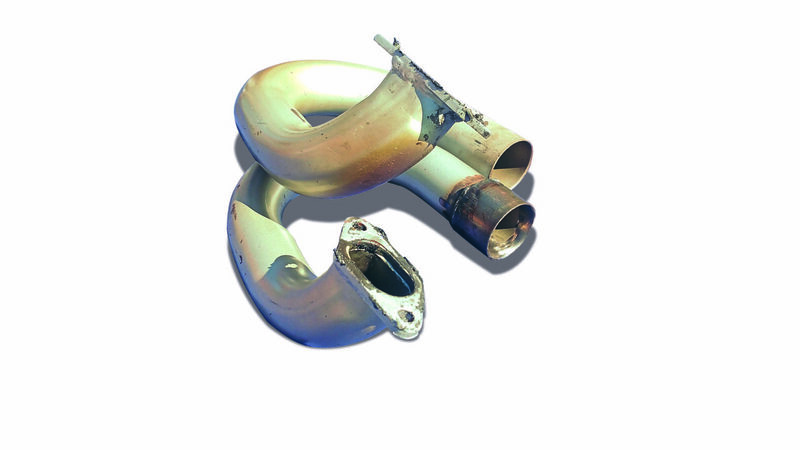 This 42mm clubman has a 39mm internal diameter (ID) header pipe at the main body connection point and runs through a measured 19.5mm ID outlet. This produced 16.28bhp at peak, but at a very hight 8500rpm. Clubmans revving higher than expansion pipes?! Not the common belief, but actually more often the case, this one being around 1600rpm higher. Falling 8hp shy of the expansion it’s a mahor power loss to give up on this motor spec, and only betters it for a short period between 4000rpm and 5000rpm. The higher rpm hurts the torque figure which was 12.8lb-ft at 49000rpm. This was a quieter system but did show on the graphy as a little bumpy, along with the only header pipe that burnt brown and blistered its paint near its exit. My belief is that it was gassing up a bit and holding heat as a result, so possibly too restrictive at this power output yet probably fine on a more standard (lower bhp) motor. Fit at the cylinder was good but required a minor trim on the chaincase bracket. 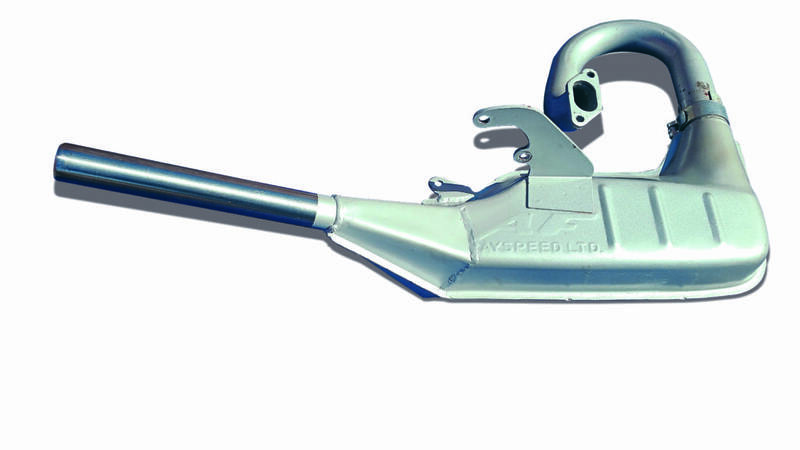 Next the AF slope-side at about £88 appears to be an evolution of the standard offering using the same 39mm ID header pipe and 19.5 outlet, with a redesigned box and slope side which improves ground clearance a lot. This pipe produced 17.23bhp at a lower 8000rpm (but still 1100rpm higher than expansion) the fit at the cylinder was good, but required a minor trim on the chaincase bracket. Next the AF VW 42mm pipe with its 39mm ID header pipe and large outlet meaning it will breathe well, so should suit bigger motors better and is available at about £98. Sitting higher up at the rear with its VW styled tailpipe it’s a move away from the traditional look that may not suit all, but made a healthy 19.94bhp at 7300rpm. 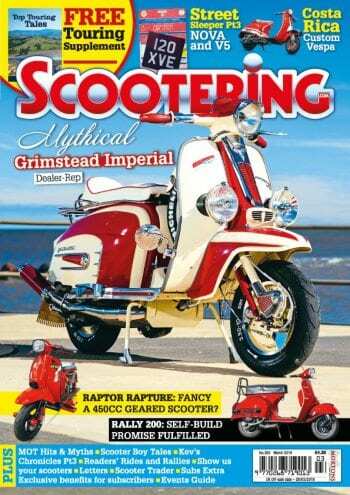 This brings it within 400rpm of the expansions’s rpm peak, yet still falling around 4.5bhp short. It made 14.5lb-ft of torque at 4500rpm. This was quite noisy so would upset the neighbours if out early in a morning. Last test for this batch is the AF big bore clubman with its 44mm ID header. It’s the first big bore test and comes with a big outlet pipe size of over 25mm so should suit bigger motors, these are about £90. If fitted up at cylinder well but chaincase and tailpipe brackets needed adjusting, although this was just an old test pipe they let me grab fromt the back room so no pre-delivery checks as such, It made 19.65bhp at 6800rpm so 100rpm lower than the expansion, thus also giving the highest torque figure of the clubmans tested at 15.6lb-ft at 6300rpm. As an experimental test, the 48mm Big-Bore Clubman pipe was re-tested with a modified 42mm header pipe with its smaller 39mm ID just to see how the compared, the small bore header boosted low rpm power but faded off earlier up the top, not much difference at either end but worth the test. Original Big-Bore with standard header shown in blue this time, and same pipe but with small-bore header shown in red. 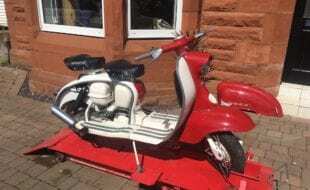 Red: Standard AF Clubman. Blue: AF Slop Side. Green: AF VW. Purple: AF Big Bore 48mm. The first chart shows power output of every pipe in 1000rpm steps, ranging from 4000-9000rpm, plus each pipe’s peak figure, thus showing which pipe has most power at each rpm range. In the second graph, we used the results above and awarded 4 points for the highest performer at each rpm range (and max hp) down to 3, 2 and 1 for the lowest. So highest points gives the winner showing the best average. It’s worth noting, the Big-Bore was only just beaten by the VW in the 4000-6000 range, due to a low 4000rpm reading, had we done a column showing 5000-7000rpm winners, the Big-Bore would have come out on top. 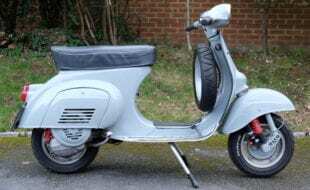 Although the VW is winner of both overall spread and peak power, the Big-Bore beats it from 4200-7200rpm, which is prime riding range for many scooters. Another result was scored at 7000rpm, 8000rpm and 9000rpm as an indicator of high rpm results, for those wanting to ‘stretch the engines legs’. For our first series of tests, the VW 42mm cleans up in all areas in terms of performance with the 48mm Big-Bore running close behind it. 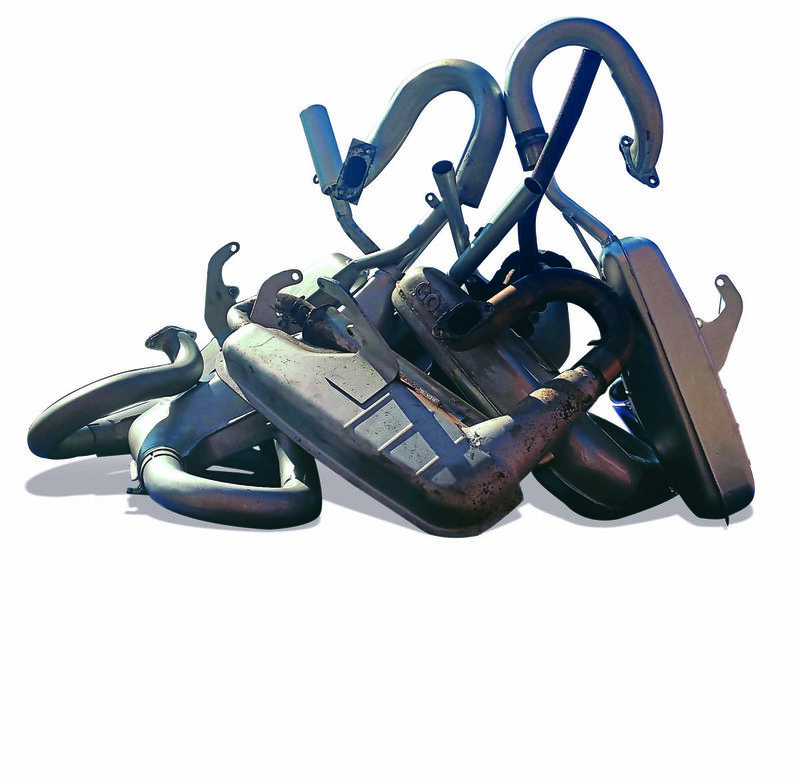 But as we know there are many other factors that influence your choice in deciding which exhaust system to choose. This includes the noise level of each pipe tested, that incidentally goes in the same results order as performance the VW system being the noisiest and the standard AF 42mm being the quietest. 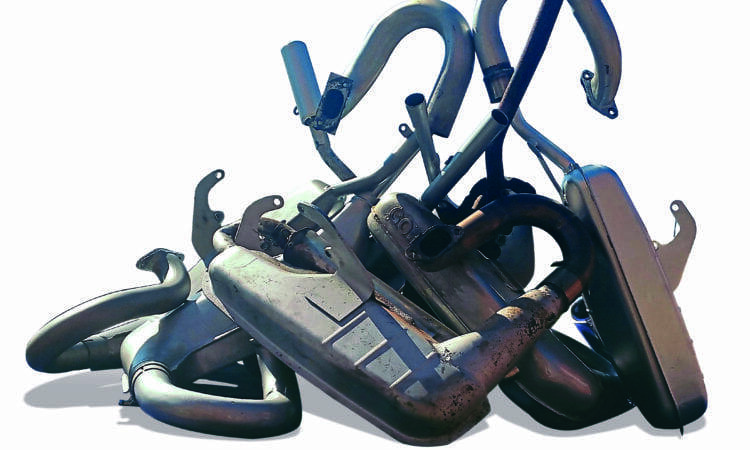 The style of exhaust, its finish, build quality, ease of fitment (or even poor fit requiring alteration) price, availability, and warranty will all factor into your decision making, on top of the performance aspect that this series of articles is focusing on. This is just the tip of the iceberg in terms of the pipes to best tested, the result, comparison, and other information (like fit, running temps and noise) which we have yet to unravel. Lined up for our next clubman test are offerings from Scootopia, Ancilotti, Con, BGM, Ron Moss, Mito and any others we can get our oily hands on. Got something to test? We’d like to hear from you ASAP so we can include it. If you don’t get involved, don’t complain when you’re not included!